Threads | The Official Blog of Lab Seven Screen Printing Co. The Official Blog of Lab Seven Screen Printing Co. 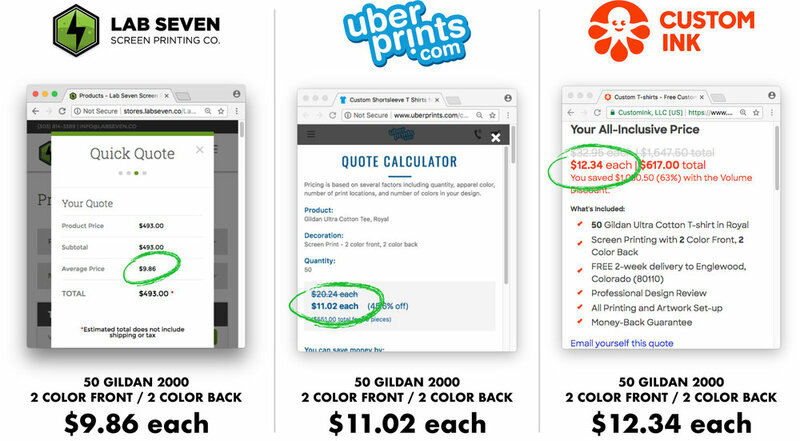 Many of the large custom print sites don’t actually do any printing. 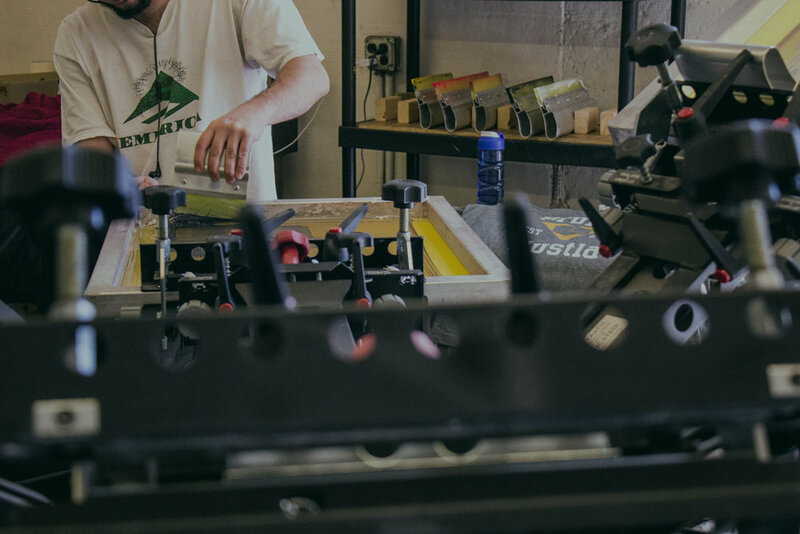 They collect your order through their automated website, and relay it to a regional screen printing company to fulfill hundreds of orders in bulk. This 'middle man' philosophy brings print costs up, and also puts your project in the hands of printers who know nothing about your unique project needs. At Lab Seven we’re excited to be able to offer all of the benefits of an online design tool and online ordering system, but we're also able to design, proof, and print everything right here in our production facility by our dedicated team. Your order is overseen with care by our team of artists and project managers throughout the entire production process. Our small, tight-knit crew of project managers are available at any point in the process to provide guidance and assistance, address concerns, and make changes. Please feel free to come down and meet with us in person, call in, or send an email and rest assured that you are corresponding with the actual person who will watch your order being screen printed. Thank you for considering Lab Seven Screen Printing for your project – we appreciate the opportunity to serve you, and encourage you to get your custom tees printed locally! Collecting orders: Managing orders from many people at once can be confusing and stressful. What if there was a way to put order responsibilities directly in the hands of your consumer? Product demand: With high volume print discounts, you want the best bang for your buck. But making the leap for a large order without sure demand can be risky! Startup capital: You know your vision will take off once you get it off the ground, but as the old adage goes "it takes money to make money". You can now host your own online web store! We create digital mockups of the apparel products that you want to offer for sale and host them in our clean, fully e-commerce, secure website fully branded with your logo and imagery. We give you pricing for the production, and let you set your own retail prices accordingly. (set your own profit margins) We'll send you a live link to your online storefront to distribute through email and across social media, and you're open for business! Use as a fundraiser! Many of our schools, sports programs, crossfits, and churches use these stores as an opportunity to raise funds for their organizations. We can even set a fundraising goal on the site that will update with every order. You can leave the store up until the goal is met, or for any set period of time. Lower initial investment costs. Many of you have had design ideas you’ve always wanted to market and sell but don’t have the capital to begin production. Now, you can gauge interest by offering your products before they're produced, and let customers fund the project themselves. Hosting is cheaper than developing and managing your own e-commerce web site. Other than a $75 build fee to set up your store, there is no monthly cost for us to host it for you and we don’t charge processing fees for each sale. Because of our pricing structure, and with consideration to setup and labor times, all orders for each store are produced at one time. Stores cannot be open indefinitely. Most stores will be open for a pre-determined period of time. The most effective time frame that we’ve found is 2 weeks. Alternatively, we can keep the store open until specific sales goals are met, but keep in mind how long your customers have to wait for their merchandise. Production for the garments takes approximately 10 business days once the store is closed. You must meet the production minimums initially quoted. For example, if you anticipate selling at least 24 pieces of each style, you must sell at least that many pieces in order to keep production costs accurate. If the sales just aren't happening as expected, we can still fulfill the order, however - the production cost may increase depending on the final size of the order. The store manager (you) agrees to promote the store via e-mail and social media. We recommend that you send out at least three store promotional notices throughout the sale. The first notice when the store launches, a second mid way through, and a third notice (reminding customers that the store is closing soon) 48 hours before store closing. Once the store is closed we begin production! Your items are printed/sewn within 10 business days of store closing. We will let you know when the product is available for pickup, or we can ship the entire order directly to you. We will provide order receipts for your customers, and a detailed packing slip so that you can accurately distribute the merchandise. We charge a one time $75.00 build fee to set up your store for you. This includes up to 4 different apparel items in your store. Additional designs are $15 each. Can you do individual fulfillment/distribution? At this time, we only fulfill the entire order at once (to you or the store manager.) We do not distribute or ship individual orders. Can I monitor the store? Yes! We can provide automatic daily sales updates, or send you an email for every individual order as it comes through! How many products can I offer? As many as you'd like, but keep in mind our production minimums per design (we need at least 12 orders per setup in order to take it to production), and the law of diminishing returns – too many options can actually limit your sales. There are also additional fees for creating more than 4 products for each store. How often can I open the store? As often as economically practical! If you want to open the same store again, we won't charge you to set it up. Just let us know when to open, and for how long, and your store will be live again! What if I want to order extras? Use your profit margins to add more items to your order! Just let us know what sizes / styles you want to add to your inventory, and we'll add them to the order when we print, and subtract the cost from your account balance. If you're interested in creating a custom web store, please give us a call or send us a note! Typically with screen printing, print brightness and print softness are inversely proportional. As wearers of t-shirts, (it's practically the uniform here at The Lab) it is always our priority to deliver the softest and most comfortable prints possible. The print should be seen, not felt! Nobody wants a nice soft, breathable tee with a stiff, sticky screen print on it! As with any major endeavor, the best way to ensure a successful outcome is to begin with the end goal in mind. Understanding the variables that best lend themselves to soft screen prints before you begin designing can make a huge difference once we get your design up on the press. That said, here are few helpful screen printing “inside baseball” tips to keep in mind before you begin your project that will help make your prints as soft as can be! Whether you’re an Adobe veteran, tinkering in our Design Lab, or working directly one of our in house artists – knowing how different inks and fabrics interact will go a long way in creating something we're all proud of! 'Dark on Light' is one of the simplest workarounds to the heavy print problem. Wherever possible and desirable, try a higher contrast color scheme so that the ink colors being printed are darker than the shirt color they are being printed on (i.e Black ink on a green shirt or Blue ink on a heather gray tee). In this scenario, we can print with significantly less ink deposit on the garment resulting in a much softer feeling print. Alternatively, printing light or bright colors on DARK shirts naturally lends itself to a thicker print – we have to print with a heavier opacity ink, and often with a white under-base to get accurate and bright Pantone colors. Intentionally 'aging' your print with subtractive texturing is another helpful tool. With this technique, we apply a distressed texture or filter over the design which subtly removes information from the artwork to make it appear faded, aged and worn. This also allows for a lighter ink deposit while still keeping colors true to Pantone. More of the shirt color is revealed in the print which also contributes to the effect. This is a great option if it fits with your design style. This process works on any shirt color except whites and heather/blended fabrics. If this application interests you, just mention discharge printing when you call or email, and we can make sure to steer you in the right direction! If you still want your prints to be almost undetectable, but the off-white discharge color just won't do for you, plasti-charge printing is a combination of the discharge agent and standard plastisol ink (see below). With this screen printing technique, we can still achieve custom colors and very soft prints, but the color saturation tends to be a little more on the muted and pastel side of the spectrum (think un-coated Pantone colors instead of solid coated). If you're looking for very saturated, bright ink colors, this may not be your best choice. This process uses the dye removing elements of the discharge agent to neutralize the fabric while at the same time depositing the pigment from the plastisol ink on top. Once machine washed, almost all of the ink material washes away leaving the pigment from the ink, but virtually no plastisol texture. The result is a nice, soft print just like we planned! Again, with this option, the shirt must be 100% cotton (although we have found a way to get bright white plasticharge on triblend shirts, assuming your artwork happens to be all white). We hope you’ve found this informative and helpful. Feel free to share this article to inform your designers, friends, and fellow screen printing enthusiasts! As always, call or write with questions! We love shirts. We want you to love your shirts. The following is a quick write up intended to help you learn more about the fit, fabric, style and cost of the options available. The more information you have prior to ordering your custom printed tees the more likely you are to be 100% pleased with the final product. No surprises! Combed Cotton is the least expensive. The 'standard' 100% Cotton t-shirt since the 1980's – It has a more dense feel to it. It is high quality and works well for an event or group on a tight budget. (They come in almost every color imaginable) Combed cotton shirts, however, are not as soft as other options. If softness and a more fitted shirt are your preference this fabric may not be the style for you. Combed cotton is also often blended with polyester making it slightly softer and more breathable. 50/50 combed cotton/poly blended shirts are also quite budget friendly. These are usually pre-shrunk but you might still see some shrinkage with 100% cotton. Some shirt styles in this fabric would be the Gildan 5000, Gildan 2000, Gildan 8000, Jerzees 29M, Jerseys 363, Fruit of the Loom 3931, Hanes 5280. Ringspun cotton is still 100% cotton, but is a much softer fabric than combed cotton. When the yarn is spun it’s pulled over a ring which slightly frays the fabric (on a microscopic level) making the t-shirt material feel softer and the knit looser. Many people prefer the feel of this material to combed cotton. Ringspun cotton is slightly more expensive than combed but can still be quite budget friendly. Shirts with Ringspun cotton tend to be more fitted, modern, and fashion forward. Be sure to order up a size if you or your group do not want shirts as form-fitting as these tend to be. These are usually pre-shrunk but you might still see some shrinkage (as with all 100% cotton shirts). Popular brands and style numbers with this fabric are Gildan 64000, Next Level 3600, Tultex 202, Canvas 3001, District DT104, Anvil 980, Hanes 5180. Cotton/Poly blends are softer and lighter than ring spun cotton. This is one of the most popular choices for the majority of our customers, as it is a great balance between 'retail-ready' feel and affordability. They can also be referred to as 50/50, 60/40, CVC, or Heather Tees. They are usually fitted to form so again be sure to order up a size if a 'mannequin' fit is not what you find comfortable. These fabrics generally do not shrink much. A soft ringspun cotton/poly blend style is a touch higher in price but, depending on your project, most find the added value to be well worth it. Color options in blended tees are usually heathered (meaning they have a slight flecked / speckled look due to inter-knitted yarns of slightly different colors). Brands and their style numbers in this fabric would be Next Level 6200, Next Level N6210, Next Level 6410, Canvas 3650, Tultex 241, District DM108. Typically the softest (and most expensive) tees we have available, tri-blend shirts are fast becoming the most popular fabric style with our customers. If it fits within your budget, we think you’ll find it to be very popular with your organization. This fabric is a blend of 50% polyester, 25% ringspun cotton and 25% rayon. The blend of these materials yields a tee shirt material that is very soft, flowy, and breathable. It fits well to form (again, order larger if preferred) but does not shrink. Color options for tri-blend tees are the most limited, and are almost always heathered. Our most popular brands and style numbers for tri-blends are Next Level 6010, Canvas 3413, Tultex 254, District DM130, Anvil 6750. If you’re looking for a no-gimmicks, classic tee, and want to spend as little as possible, go with a Combed Cotton Tee. (you probably already have a handful of these in your closet from that car show, school event, or youth group retreat) Lab Seven recommends the Gildan 2000. If you're looking for something soft, affordable, and fashion forward, go with a Ringspun Cotton Tee. Lab Seven Recommends the Canvas 3001 or Next Level 3600. If you want something a little more high-end, super soft, and retail ready (for a custom apparel brand or clothing company), you can't go wrong with a Cotton/Poly Blend. Lab Seven recommends the Next Level N6210. Finally, if your budget is generous, and you want the softest shirt available – something that breathes easily, flows in the wind, and could be sold for $28.00 at Urban Outfitters, go with the Tri-blend. Lab Seven recommends the Canvas 3413. We hope you find this information helpful! As always, please check out our catalog to explore these styles further (plus many others). Additionally, feel free to shoot us an email at info@labseven.co or give us a call at (303) 814-3389 if you need any recommendations or have any questions! We'd love to be your screen printer and we’re always happy to meet with you in person if you'd like to get your hands on these actual physical shirt styles, or try anything on for yourself! If you’re in the Denver / Englewood area, give us a call to set up a time to come by the shop!